In the span of six short weeks, Professor James Hartman and his cast of nine have prepared Schoolcraft’s best production to date. Professional discipline, cast chemistry, and a dedicated stage crew have come together to create a moving theatrical experience for all ages. A break from the theater department’s normal Shakespearean fare, which is Professor Hartman’s specialty, “All my Sons” was chosen because it is a personal favorite of Hartman’s, as well as being “serious, modern, and something new.” Professor Hartman wished to emphasize Miller’s postwar themes of sacrifice and responsibility, especially considering the production’s proximity to Veteran’s Day. The plot also explores the ideas of family loyalty, love, and guilt. A diverse and driven cast bring life to this dark drama. Leads Paul Schimmel and Jessica Duffey play Joe and Kate Keller respectively, highlighting the struggles of a couple in their twilight grappling with dark and lethal family secrets, as well as grieving for their eldest son, Larry, who is missing in action at the end of WWII. Jack Cowper plays the dapper younger Keller, Chris, who is in love with the charming and beautiful Ann Deever, played by Ronya Mallad. Their covert, steamy love affair brings tension to the plot as Mrs. Keller and George Deever, dutifully portrayed by Franz Margitza, actively try to break Ann and Chris apart. The cast is rounded out by the amusingly quirky Dr. and Mrs. Bayliss, played by Thomas Posler and Kristen Campbell, as well as the delightfully eccentric Mr. and Mrs. Lubey, portrayed by Sean Thomas and Bridget Coletta. Discipline is the name of the game for this group of actors. A blend of Schoolcraft students and members of the greater community, each actor was required to memorize their lines in three weeks and put in at least 15 hours of stage time each week. Actress Jessica Duffey explained some of the sacrifices the cast had to make in order to make it to opening night. “I work two jobs and have a five year-old at home,” she emphasized, which leaves little time for mistakes. Such is the case, as Professor Hartman noted making cast changes early in production. “All the actors are replaceable, and they are auditioning every night they come in,” Hartman said. Anyone seeing the play will notice how seriously Hartman, a member of the Screen Actors Guild and Association for Theater in Higher Education, takes his work. Walk to the rear of the theater and he will be seen at his lectern, vigorously taking notes to improve the next performance. Of course, no show would go on without a talented and dedicated stage crew to create both the sets on stage and create the mood through music and lighting. Creating the illusion of the back yard to a well-appointed and luxurious home, Stage Manager Candise Christenson and her team built a two-story set with a balcony, creeping, hand-strung ivy, and period-appropriate furnishings. Amazingly, the set was constructed piecemeal over the course of production using no more than five stage hands, often only two or three people at a time. In addition, Nurah Stanley stepped up admirably when tasked with coordinating both lighting and music as the Lighting and Sound Technician. 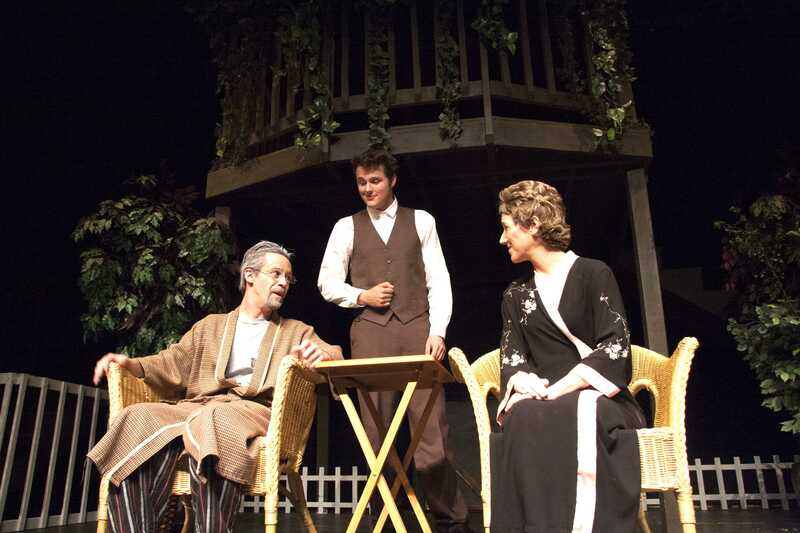 Running through Nov. 9, tickets for “All my Sons” are $15 and can be purchased through the Student Activities Office. In April and March 2014, Hartman will produce Noel Coward’s “Blithe Spirit”, a comedy about a séance gone wrong. 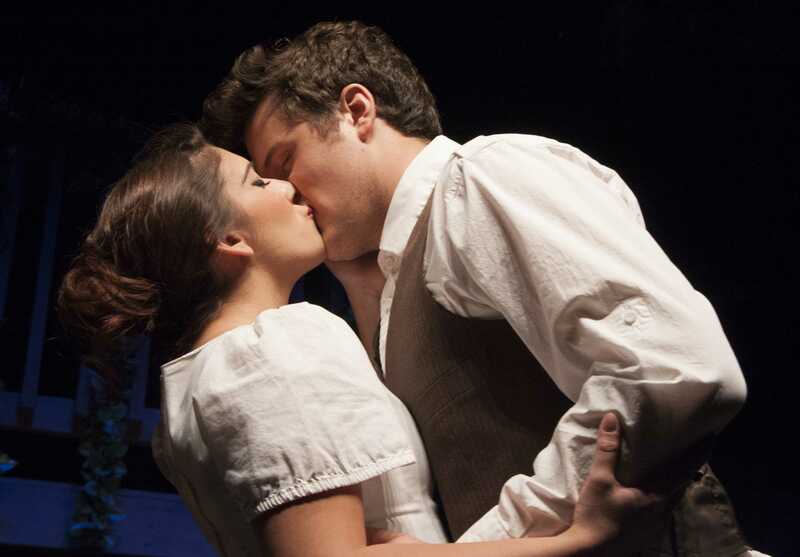 Auditions, as in the past, are open to all Schoolcraft students and the community at large.